Snack Girl has been working on a "new" Rice Krispie treat for a while now. First, I had to change the name. Mine are called, "Crispy Rice Treats", catchy, no? These would work for this recipe and give it more nutrients. You can use any PUFFY cereal, really, that you like - wheat puffs, Cheerios, anything you have in your cupboard. Now, I used marshmallows, which are not exactly the healthiest ingredient. I TRIED honey and it just didn't work. As I ate them, I kept missing the marshmallows and I couldn't give them up. I have seen marshmallows without Blue #1 at Whole Foods (but I didn't buy them because I am cheap). I did exchange the butter for coconut oil (in the natural foods section of the supermarket) because it has been getting some good press lately. It seems that the saturated fat in coconut oil is actually good for you! It is called "lauric acid" and unlike saturated animal fats it has been found to increase good cholesterol. So, I used coconut oil which also imparts a sweetness. If you can't find it, don't be too upset. Just go ahead and use butter. Finally, I added good stuff - dried cranberries, chopped almonds, and dark chocolate chips and this tray of "Crispy Treats" lasted all of 10 minutes in my house. These are super fun to make, fast, and very satisfying. My daughter (with a little help) can make them for an afternoon snack and they taste SO much better than any packaged cookie or bar. My Crispy Rice Treats are defined as TREATS, so watch it on the amounts. I did managed to sneak in some good stuff with the nuts and berries. And, these treats would be a fantastic addition to a tea party! Foodbuzz, my advertiser, will donate $50 to the Ovarian Cancer Research Fund for every tea party recipe that is submitted to them (and I am submitting this one). You can select the perfect tea party outfit on Kelly Confidential and they will donate $1 to the Ovarian Cancer Research Fund. Spray non-stick spray on 8x8 inch square pan (or equivalent). Melt coconut oil in large saucepan over low heat and add marshmallows. Stir CONSTANTLY until melted and mix in cereal and whatever else you choose to add in. Press into prepared pan. Cool for 10 minutes and cut into squares. I submitted a tea party recipe to Foodbuzz. Is anything special required to ensure the donation to ovarian cancer research? OMG these sound so awesome!!! I love rice krispy treats, but never really make them because I can't stand the whole ton of butter thing. But never thought of using coconut oil. Hooray! Awesome recipe, I'm definitely gona try this! I used dried cherries with the dark choc & no nuts. One word: Amazing. I was able to find the kelly's tea party site www.Kelly-Confidential.com, but not the place on Foodbuzz, where you can add a recipe and have them donate $50. Please send a link. Thanks! @Ashia - you are so sweet! Actually, I submitted this post to FoodBuzz and because I did this - they will give $50 to Ovarian Research Fund. You need to be a "featured publisher" to submit a recipe for them to donate - which means you have a blog that shows FoodBuzz ads. Thanks for the inspiration and new ideas!! 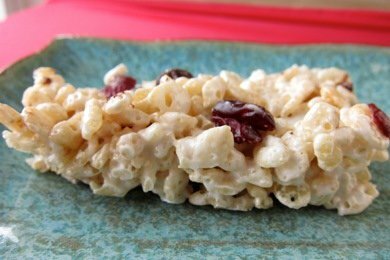 I tried swapping rice krispies with some plain puffed brown rice cereal a while back, but they came out annoyingly chewy... more of a gooey and too-chewy rice treat, not crispy at all. I was hoping the texture would be at least some like the original recipe/cereal. They were disappointing, but okay. My kids gave them a thumb's down. I was wondering if anyone had any recommendations when using puffed brown rice cereal? I thought I'd try maybe toasting the cereal in a dry skillet or in the oven first to add some more crispyness to it before i toss it in the marshmallow goo, but i'm not sure if that would help. I'll for sure add some nuts and dried fruit.... what a great idea! Sounds wonderful. I'm going to have to give them a try. I get Coconut oil at Wal-Mart. Doesn't Kashi make a puffed rice style cereal? I've wondered since before your posting about using the fiber one twigs and making these.I'm going to have to get on it! We have a little one who has the need to up his fiber, adding in the dried fruit and nuts would be even better. I've made a version from Ellie Krieger that uses peanut butter and honey with brown rice puffs - we really liked it! And veganize it by making sure you get Vegan Marshmallows, which you do have to get from special places. Most Marshmallows have gelatin (ick) in them. Have you thought about using Ricemellow Creme? It's a gluten-free, vegan, non-dairy marshmallow creme made with brown rice syrup. The brand I got was called Suzanne's and it came from my local natural foods store. My neighbor brought me a huge plate of rice krispie treats with dried cherries and toasted almonds and we ate 1/2 of them and put rest in freezer for later. I want to make them with toasted pecans since I have them. excellent recipe! The coconut oil worked wonders. I love the scent...it gives a tropical flavor to the treat. Thanks.